Mazarin is a classic Swedish pastry, well known in neighboring countries, as well in lots of variations... Mazarin tarts, cakes or pastries. These tasty treats are said to have been named after the French-Italian cardinal and diplomat Jules Mazarin (1602 - 1661), successor of the powerful Cardinal Richelieu. This recipe was a prize winner in 1965. There are two suggested fillings – the one using almond paste is quicker to prepare. 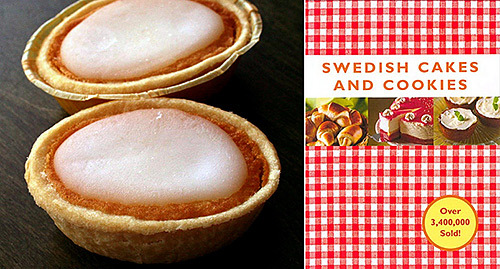 The recipe is in one of our favorite classic cookbooks Swedish Cakes and Cookies and reprinted with permission by Skyhorse Publishing, Inc. Combine the dry ingredients. Dice the butter and cut it into the flour mixture. Add the egg, mixing well. Wrap in plastic and refrigerate for several hours. Filling 1: Melt the butter and let it cool. Beat the eggs and sugar until light yellow and very thick. Stir in the almonds and melted butter. Filling 2: Beat the butter until fluffy. Grate the almond paste and add. Beat in the eggs, one at a time, beating well after each. Stir in the flour and baking powder. Grease individual oval tins. Press or roll out the dough and line the tins. Spoon one of the fillings into the pastry shells. Bake in the bottom half of the oven for around 15 minutes. Let cool for a few minutes, then remove from the pans. Garnish: Beat the sugar and water until smooth. Brush on or sift powdered sugar over tops. Note: It takes a while to make them and be careful to follow the recipe. To add some different flavors to the Mazarins, add a click of apple sauce, or Scandiavian preserves in the bottom or a little flaked almond on top. Important. If almond paste does not taste much almond, then add some almond extract for extra flavor. 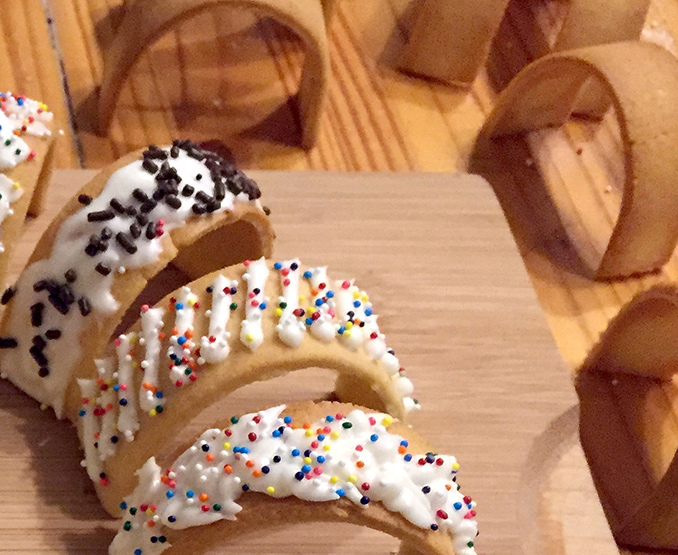 The mysterious cookie with many names: Kro Kaner, krokta, bridge cookies, spån, sponer, saddle cookies, wafer cookies, rock-a-bye's, Santa Lucia cookies, bracelet cookies, or even horse collar cookies. Whatever you like to call them, they are a delight to make and eat! These Swedish / Scandinavian / Danish sugar cookies are baked on Krokaner Tins that look like upside down french bread forms. 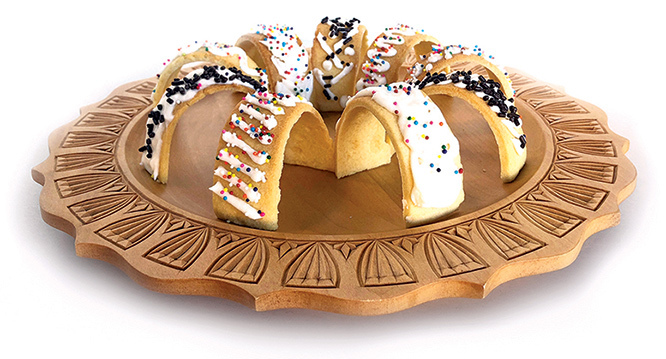 Some people arrange them on a plate to make a Santa Lucia "crown”. Cream butter and sugar together. Add the other ingredients in order given. Mix with hands. Roll thin to about 1/8”. 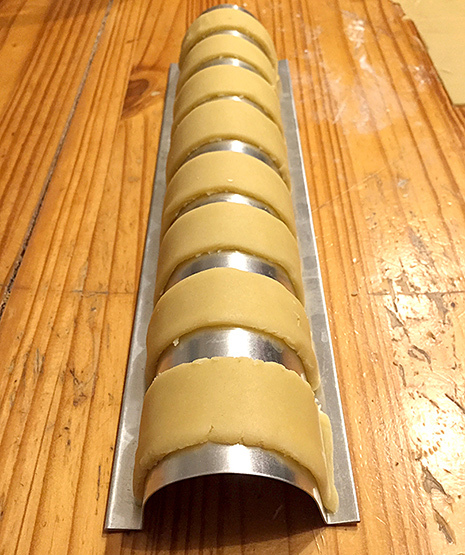 Cut in length desired (6" x 1") and put on rounded non-greased Krokaner Tins (do so while pan is cool). Bake 375 degrees, 6-8 min. until just golden. Remove cookies when cool, frost as desired. 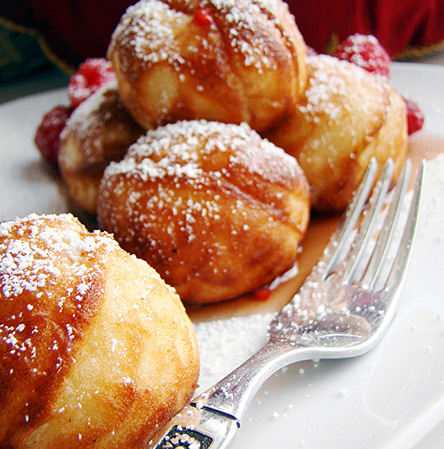 Æbleskiver (pronounced ah-bel-skee-ver), are traditional Danish Pancake Balls. Similar to European pancakes crossed with a popover or Yorkshire pudding, Æbleskiver are solid like a pancake but light and fluffy like a popover. These delicious balls are usually filled with berry preserves, but are amazing with small savory fillings too. Cooked in an Æbleskiver Pan, they easily can become a tradition in any home. 3 egg whites until stiff, and fold in well (until white streaks are gone). Fry in Æbleskiver Pan, putting 2 tablespoons of batter into each cup. (First, put dot of shortening in each cup of the heated pan). and then again and again until it forms a round shape and becomes cooked and golden brown on all sides. or try a modern savory twist with suggestions form Kevin Krafts wonderful cookbook Ebelskivers. Add a dollop of filling in center of batter in cup and then begin turning as soon as a crust begins to form. *A knitting needle or chop stick also work great for turning. 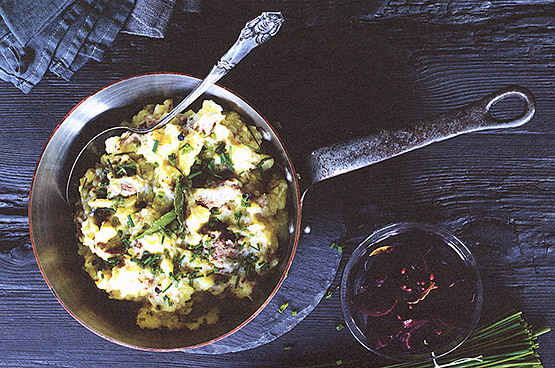 Here is a classic Scandinavian comfort food dish: a mash cooked with meat and wonderful flavors, typically accompanied by chives and pickled beets. This recipe is 100 years old. After the second World War, it became popular in Copenhagen restaurants, especially at Tivoli Gardens. Make plenty... it's even better tasting the second day! This satisfying recipe is from Scandinavian Comfort Food – Embracing the Art of Hygge by Trine Hanneman. or available (ready to eat) at Ingebretsen's. Cut the steak into ¾ inch cubes. Heat 1 tbs butter in a large saucepan, add the steak and brown lightly, then add the water and bring gradually to boil. Skim off any froth from the surface. Add the onions, bay leaves, thyme, cloves, peppercorns and salt and simmer for an hour. While it is simmering, peel the potatoes and cut into ¾ inch cubes. Add the the meat and simmer for another hour, or until the meat is very tender and falls apart easily. Drain off any excess water then stir in the remaining 2 Tbs butter. Whisk or stir the meat and potatoes into a mash, with the stew remaining lumpy. Serve sprinkled with chopped chives, with the pickled beets and rye bread along side. and originally a tradition reserved for Shrove Tuesday, the last day before the 40 days of the Lenten season. 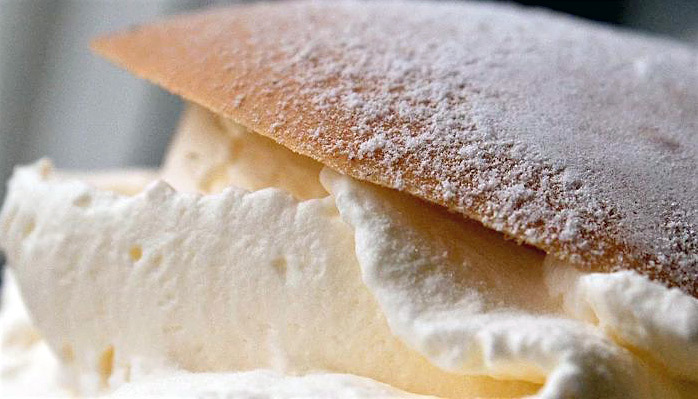 These days, things are a bit more relaxed and the eating of a Semla is now a more common Tuesday event for the Swedes throughout the 40 days of Lent. Melt the butter and add the milk. Heat to 115. Add in flour, sugar, salt, cardamom, baking powder and yeast. Add the egg and the milk mixture. Knead the dough until smooth and elastic. Cover bowl and allow to rise in a warm spot for 30 minutes. Move the dough to a lightly floured surface and knead until smooth. Form into round balls and place on a greased baking sheet. Cover and allow to rise until doubled for 35 to 40 minutes. Brush the buns with beaten egg. Bake in preheated oven for 5 to 10 minutes, until golden brown and the center has firmed. Tear the removed bread into small pieces and place into a bowl. Moisten the bread with milk, then mix in marzipan until smooth. Add additional milk if needed until the marzipan filling is nearly as soft as pudding. Whip the cream to stiff peaks. Fill each bun with a spoonful of the bread filling and pipe the whipped cream on top. Replace the tops onto the buns and sift over confectioners sugar. (Fäviken Chef Magnus Nilsson's comprehensive & essential cookbook for authentic Nordic recipes) for sharing on our website. At first I chose Boiled Seal Intestines with Blubber, Crowberries and Roseroot Leaves. Our webmaster said “No”, the Ingebretsen's Meat Market butchers said “No”, heck, everybody said “No”. This is a recipe for a very delicious, very dense and very fantastic almond sponge cake. I usually just refer to it as “the cake”. Eat a slice with your afternoon coffee or at any other time of the day. I like to have quite a bit of acidity in it as it easily becomes too sweet. Sometimes I use lemon and sometimes I use Ättika (12%) vinegar (The Nordic Cookbook, page 656). Preparation and cooking time: 1½ hours, plus cooling time. Butter a 9 x 5 x 3 inch loaf pan and coat with breadcrumbs. 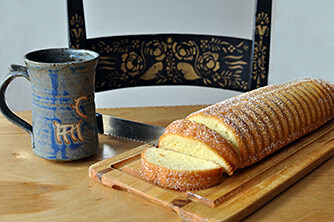 Or use the traditional Almond Cake Pan (shown & available at Ingebretsens). Place the butter, sugar, almond paste and vinegar or lemon juice in the bowl of a stand mixer. Mix until smooth and a little lighter in colour – the mix should be really stiff. Add the eggs one at a time and mix until fully incorporated. Sift the flour, baking powder and salt into the bowl. Work a bit more in the stand mixer. The flour should be mixed in well and the batter should be smooth, but do not overwork it. Pour the batter into the prepared loaf pan and bake in the oven for 1 hour. When it is done, place the cake upside down onto a wire rack to cool. This is a very important step. By inverting the cake, the fat from the butter and almonds will be given the possibility to spread evenly in it. If you leave it as it was baked to cool it will be very greasy at the bottom and too dry at the top. After a few minutes remove the pan and let the cake cool to room temperature still upside down, before cutting into it. 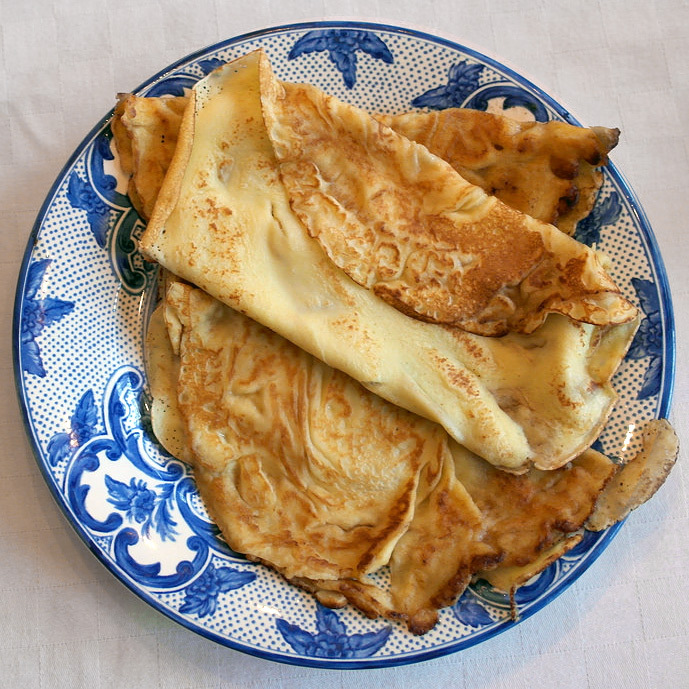 These pancakes are traditionally served with lingonberries or Lingonberry Preserves. which has seven shallow depressions, three inches in diameter. turn each pancake over with a narrow spatula and cook the other side for 1 to 2 minutes, or until golden. Serve immediately with sour cream and preserves. - Also, l.c.finn's Cardamom Extract is a great substitute for ground. Stir flour and cardamom together and set aside. until mixture forms ribbons when beaters are lifted. folding until batter is smooth. Fold in the melted butter. turning over once to heat both sides. Brush the grids with butter and spoon in the batter. Bake, turning once until golden brown, then remove from iron and sprinkle with powdered sugar. 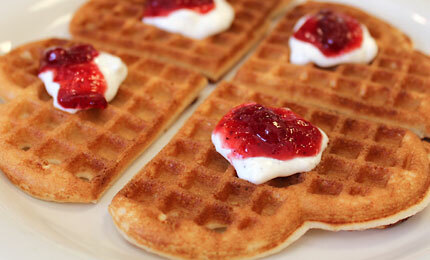 or bake waffles in a standard electric waffle iron as the manufacturer of the iron directs.